A new generation in Armenia awakens in protest over Prime Minister Serzh Sarkisian's political dominance. YEREVAN -- Grizzled opposition veterans might be running the show, but there are lots of young people protesting what they see as an illegitimate power grab by former Armenian President Serzh Sarkisian. While 42-year-old opposition lawmaker Nikol Pashinian, usually clutching a megaphone, has been the gray-bearded face on the front lines of the demonstrations, younger Armenians have provided the backbone among the crowds of thousands this week calling for the resignation of now-Prime Minister Sarkisian. They also figure prominently among the hundreds of arrests so far in the capital and two other major cities, Gyumri and Vanadzor. “This is a generation who wants to see change in Armenia and is fed up with being ruled by the same faces and the same party. They have passion and principles,” Thomas de Waal, a senior fellow with Carnegie Europe who specializes in Eastern Europe and the Caucasus region, told RFE/RL. 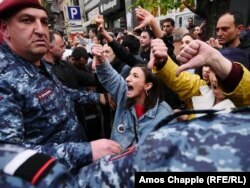 Protests erupted on April 13 with lawmakers poised to vote in Sarkisian, a 63-year-old former military officer, as prime minister, consolidating his dominance after a decade as president of the former Soviet republic of around 3 million people. The specter of Sarkisian's tactic pushed groups of young activists, students, and other opposition supporters to organize marches and block streets. Still, on April 17, eight days after his handpicked presidential successor was elected by parliament, Sarkisian was voted prime minister in a 76-17 vote. Term limits meant he could not run again, but constitutional changes approved through a 2015 referendum made the prime minister’s position more powerful at the expense of the president, opening up an avenue for Sarkisian to retain power. “We have joined the protests for our rights, for our future,” said 25-year-old student Mikayel Nazarian, whose picture with another protester, Ani Hakobjanian, while in a romantic embrace against a backdrop of razor wire went viral on social media. “I think this student awakening is the strongest prerequisite for the formation of civil society, and I think it will lead to serious changes both inside the education sector and beyond for students as citizens and parents” he added. The push to remove Sarkisian from power appears similar to the "Electric Yerevan" protests that erupted in 2015 against a steep hike in energy prices and shady privatization plans. Those demonstrations were also led by youth groups organized under the name “No To Plunder.” They wanted the government to scrap a planned 17 percent increase in the price of electricity, a goal that was partially achieved. A young protester is led away by police on April 20. 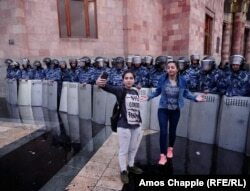 While there were no official estimates on the demographics of the current protests, video and photographs appear to show the majority of those on the streets are students and younger Armenians looking to break down barriers. “I can see young people, a post-independence generation, who are ready to rise up. This spirit must be maintained. It must not be broken,” Armen Rustamyan, a member of the Armenian Revolutionary Federation Bureau and the party’s parliamentary bloc, told RFE/RL. Protest leader Pashinian has called for the start of a national “velvet revolution,” a reference to the nonviolent political transition in Czechoslovakia from communism to a Western-style democracy at the end of 1989. That revolution was sparked by student protests on the streets of Prague that turned violent and brought the rest of the nation out in support. “People are unhappy about the situation in the country, unhappy about the developments in the country during the past 10 years and do not want the country to continue in the same direction,” said 23-year-old Mikayel Ghukasian, a student at Yerevan State University. 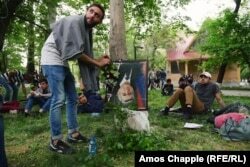 A young man places a flower onto an upside-down portrait of Prime Minister Serzh Sarkisian in a children’s park in Yerevan. The frame features a black strip of cloth at the corner, traditionally placed over a portrait when someone is dead. There are signs the voice of youth is being heard. 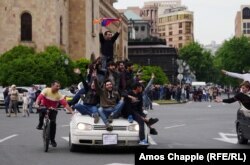 One of Yerevan’s main bridges was blocked on April 20 by three heavy trucks after the crowd reached it early in the afternoon. The truck drivers left their vehicles parked there and joined the “Reject Serzh” marchers headed toward parliament. Carnegie’s de Waal said he sees parallels between the current situation and the Electric Yerevan protests, but noted that the protesters still lack structure and organization. “They don’t have a political party affiliation, much of a defined leadership or good organization, which means that the current Armenian regime can sit the protests out and wait for them to dissipate of their own accord,” he said.